Capturing the snakes, putting them in a pitcher and taking them to the cities and villages to show it to be people. This is the profession of the Sanwara tribe. The people of this nomadic tribe usually spend their lives amongst snakes. The government initiated to improve their lives and settled them in Karigikala village of Bilaspur district. Under the Pradhan Mantri Awas Yojana, 29 families were provided with one house each. Provided them with employment by giving the work of MNREGA. Got the children admitted in the nearby government schools. The children who were until now playing with snakes are now studying in school. They have been provided with free Uniform as well as books and notebooks. One example is Ghoran Singh’s 11-year-old daughter Purnima has been directly admitted to the fifth grade in the village. Teachers are giving extra attention to Purnima and are helping her complete the course of previous classes. 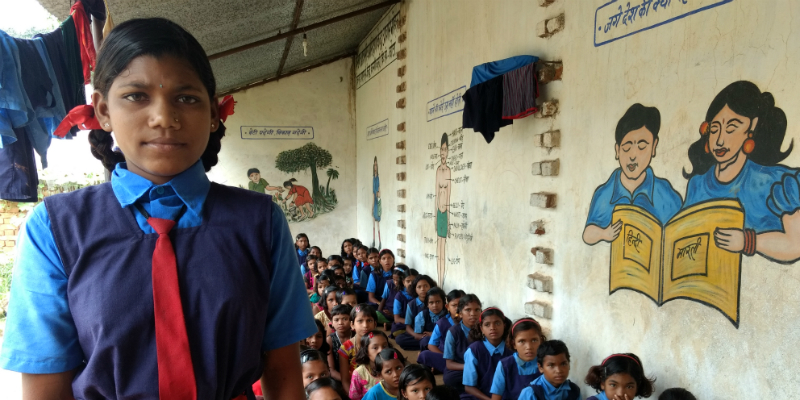 Her mother, Kutelhin Bai, says that Purnima goes to school every day. There are eight children in the house. Five girls and three boys. Purnima was third one to be born. Like the other families of the Sanwara tribe, they are also specialised in catching snakes. Their children’s toys from childhood is also a snake. Whether it is closed in the pitcher or open in the pit, they enjoy catching snakes a lot. But ever since the government gave a roof over their head, and provided them with employment, this family has stopped catching snakes. Now they are leading lives like other ordinary villagers. Chandni is also happy attending school. Her mother Rakha Bai used to teach her daughter about the kitchen work. Today Chandni is determined to study. Every day Rekha gets Chandni ready. She inspires her daughter to go to school. Her father Swarath has also started working as a daily wager. He saves most of his earnings so that he can utilise them in the future. Out if his six children, five are girls and one of them is a boy. All have started going to the schools. Swarath says that everyone knows the skill of catching a snake and plucking its teeth, but that alone would not have worked. Gathering money in the city and village is not a very sound job. Most of the times, people ask them to leave by giving away rice to them. It is not necessary that they would earn 100 bucks or so every time. Therefore, in such cases, sometimes they even had to sleep without eating moderate food. Swarath and Ghoran Singh say that they had to face great misery while leading a nomadic life. Now they have a house to live in and work for earning money. There is no need to go outside and earn money. The children have been enrolled in government schools. They are learning the alphabets of the Hindi language. They have started reading books and their life is improving. By making this arrangement for the Sanwara tribe, the government has helped them give up the work of catching snakes. Now their interest in education has started to grow. Seeing them, neighbouring children are also growing interest in studies. These children are the first generation of their families going to school to study. Nobody has been educated before this. They do not know the importance of education. They do not know how they progress through education. Ghoran Singh says that his children are the first generation in his family who have held a notebook and a pen in their hand. Looking at the atmosphere of this settlement, it seems that this initiative of the government has changed their lifestyle. The one who used to roam around in search of food and water are now growing food in the fields. The snake charmers are learning to grow crops.